Uncategorized | Welcome, web wanderer! Tom Hall’s WORLDS OF WANDER is a Platform Game Creator, an indie project, that, someday, will ship with a new game made with this tool: SECRET SPACESHIP CLUB! It’s a spiritual successor to Commander Keen! Tom and the folks at his new company, Pieces of Fun, are super excited! NOTE: We will do our best to make this is a reality in our spare time (and that also depends on what our day job’s company rules are). But we will get there. If you want to be generous and support our efforts, donate here. We want to make this thing happen. If you are willing to take that bold step with us, we are determined to get this thing to the finish line, so we can play and make some awesome, fun, cool game content, together! So click on that button to donate to our efforts with PayPal! Here’s our Video for the Kickstarter if you wanna see what we are working on. And here’s the content that we had in our Kickstarter. Thanks folks! Commander Keen’s creator, industry veteran Tom Hall, is announcing his return to fun, funny sci-fi platforming, and he wants to bring you ALL with him! Not just to play but to CREATE A GAME EASILY yourself! 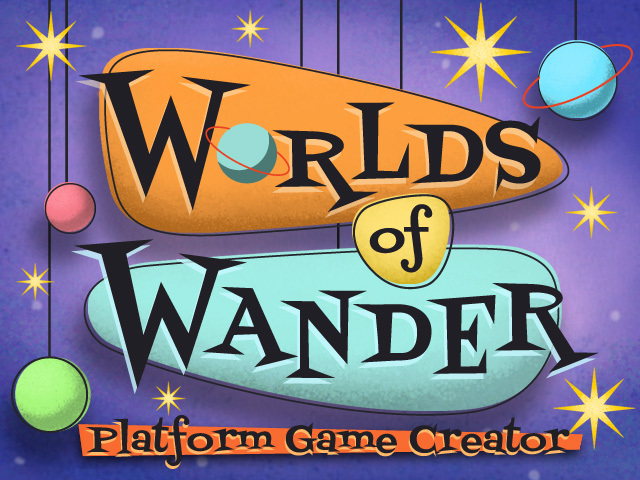 WORLDS OF WANDER is a PLATFORM GAME CREATION TOOL that lets you build and share levels, worlds, and whole game experiences with other players. But making a game can be daunting, so it starts with a COMPLETE GAME for you to mess with — the spiritual successor to Commander Keen — SECRET SPACESHIP CLUB! Tom is making SECRET SPACESHIP CLUB with this tool and then giving you the game to play, AND all the data to play with! This game will return to the quirky, funny, clever Tom Hall universe in style, and give you lots of concrete, useful data to start with. It’s easy to make a game when you start with one! You never leave the game environment — the editor is built in! Start in easy mode and just mess with something already made for you. It’s that simple! Enjoy PLAYING in — and then BUILDING — a new corner of Tom’s universe … make part of it your own! That’s why we’re here – to empower us all – and we need your help to make it a reality! Let’s have (and make) some fun! You wanna know about it — luckily we know all about it! We can get into editor details in a second… but what is that game Tom is making in WORLDS OF WANDER? What is it?!? Willie Wander and Sheila Wander think they are helping move their Grandpa to the Old Folks’ Home, but he surprises them with “one last errand before we go”… and they find themselves on a space station, joining the SECRET SPACESHIP CLUB — an organization of secret space agents who disguise their spaceships as common objects (elephants, school busses, coffee shops) only to blast off in secret and help those in galactic need! This time, it’s the BUMBLEDYBOTS! A thousand years ago, they were in a great war with a neighboring planet. It was so dire that they made their planet, Enigmata, into a gigantic Final Retaliatory Strike Attack Superbomb that would blow up their planet, the enemy, and most of their system! BUT… their war ended peacefully. All was well, until a robo-janitor bumped into THE BUTTON, and started the countdown to GALACTIC OBLITERATION! Willie and Sheila must make their way through the increasingly insane defenses put in place to stop an enemy from doing exactly what they are trying to do — STOP THE BUMBLEDYBOMB! But Secret Spaceship Club is Tom’s game. What about you? Well, this project also includes an IN-GAME EDITOR and a way to wrap your levels into a game world — PLUS a one-stop shop for trying new game content and showing off your own! And play those levels across iOS, PC, Mac, and Ubuntu Linux! Anyone can make a game level in SIMPLE MODE! Smart-draw with ground tiles, ladders, bridges, switches, and more (it nicens the edges for you), then populate your world with NPCs and enemies and objects and dangers, then hook them all up with an easy-to-use Place ‘n’ Fiddle interface! (For the brave, ADVANCED MODE opens up even more power — See Tech Talkin’ at the end.) But you can literally make a fun new level in MINUTES! And make it ANYWHERE you are! It’s a game company dedicated to making fun games, and then giving YOU the tools and the parts of the game — the literal “pieces of fun” — to play with! Tom Hall is the award-winning designer of the Commander Keen series, Wolfenstein 3D, Spear of Destiny, DOOM, Rise of the Triad, Anachronox, Hyperspace Delivery Boy, Congo Cube, and Pettington Park. His game designing career spans over 25 years! Pieces of Fun is his new venture to not only make games but to let EVERYONE make games! Joining Tom for this venture is Chris Burke, 30-year coding veteran, lead programmer on over a dozen titles, including Hellgate, The Sims 3: Life Moments, Ghost Recon Commander, and ports on numerous platforms, including Mortal Kombat and Sinistar, lending to his cross-platform skills. He joins Tom for a new era of cross-platform gaming and game creation! Along with stellar artists, they are going to let everyone play with and create new experiences with customizable Pieces of Fun! Tom really wanted to get back to making a traditional platformer and we both wanted to make a fun game and creation environment across as many platforms as we found feasible. And as this is a project to both make a game AND a community, we thought it would be great to come to the community to start it up! And with your pledge, when we start you’ll get to play the game as early as possible, providing feedback and voting on the next feature or world theme! This is the start of not just a little game and editor, but hopefully a new era of empowered creators! MP3s made it so anyone can make and share music easily. Digital cameras took an arcane art and made it so anyone can make and share images easily. It’s time to do that for games. Everyone should be able to make a little game they can call their own and share with friends. You shouldn’t have to worry about all the drudgery. It should be as simple as possible! So we have an in-game editor that just lets you draw ground, plop stuff down, and adjust things right in the level! And if you want to dig deeper, we have Advanced Mode. Or load in someone else’s level and see what they did! There have been platform game editors on some platforms, and game-making tools across many platforms. Noble, awesome efforts all. But it’s time to make things super simple, like digital photography. Everywhere, because ideas can just come to you at any time, and your editor should be right there, ready for you to create and play. This is about all of us making a cool galaxy of game worlds together, and in this era of hyper-profits and safe bets, it can be hard to sell the idea of a community of free game world players and makers. So that’s why we need you! We need to raise at least $400K for our team to get this game creator and game completed. This isn’t just a spiritual successor to Keen — it’s an editor and game content-sharing community — so that means servers, community support, lots of art and design and programming! The game design means each planet has a new art style, and thus supports a new looks for new kinds of content, and includes cool new things to use in levels, in whatever art style! So stretch goals add content, functionality and more. And early on is the Box 2D stretch goal, adding cool physics puzzles into the mix! Let’s make this thing as cool as possible, together! For international pledges and generous donors, please visit www.worldsofwander.com for paying through PayPal. Thanks! The more money we get, the more features unlock! Features like New Art Styles, New Content, New Planets, Box 2D physics support, and more! We’re excited to see how far we can go together! Game Box! T-Shirt! A BOOK! So if you want something cool like WORLDS OF WANDER to exist, if you want a new game in the spirit of Keen, but something we can all play and make games in, then please support our Kickstarter. It means a lot to us. We truly want to open games up for everyone. THIS IS JUST THE BEGINNING! The game engine is a side-scrolling platform engine, with three layers of parallax — so the background scrolls with beautiful depth behind the game! We are using Unity for cross-platform development. Thanks to the power of Unity, our game demo is running on iOS, the PC, the Mac, and Ubuntu Linux! Our intent is for the game to be on Steam (we like downloading the same game onto multiple platforms) and GOG.com (we also like DRM-free games too!) So anyway you want, that’s the way you need it, anyway you want it! In Advanced Mode, you get to peek under the Hood! Use the easy-to-learn WanderScript and change the behavior of any object in the level on the fly! Put in monsters, objects, NPCs, and more, and control them with simple clear commands, or use the WanderWizard to get a quick start on your script. Mockup of accessing an object’s WanderScript. Use the simple WanDirector to make little cutscenes to start and end levels (or to punctuate important parts of the game). Change the WanderScript controlling the whole level: how do you finish it? What do you need to collect? We’ll provide a bunch of useful objects to tell your own story with a game! Mockup of the The Editor assigning Fun Points. Then the Editor makes sure your level has enough Fun in it, and that it is finishable — then you Publish it! Thanks for your time! We hope you’ll support our Kickstarter! This is truly a cool era when folks can get together and make something they dream about come into existence. Take care! P.S. That awesome song in the video was kindly donated by Disasterpeace. It’s the track “Trio” from the soundtrack to the game KRUNCH. P.P.S. Awesome video by Jake Hughes of JuiceFilms, who did the Watchmen Motion Comics … and all the cinematics in Anachronox! P.P.P.P.S. Just kidding, that’s it! Let’s make some games!